Updated Wednesday August 29, 2018 by Red Circle Hockey Club. 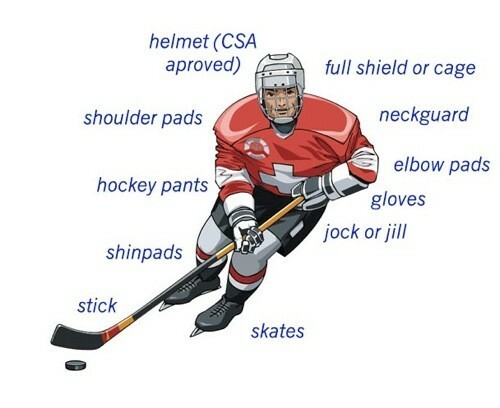 All players must be fully equipped to play or practice hockey with CSA approved hockey equipment. Your helmet should fit snug on all areas of your head. The helmet not should move around on your head - this will reduce protection and increase the risk of a concussion. The chinstrap should be adjusted so that it gently contacts your chin with your mouth closed. You will need to adjust the helmet so that it is snug without pinching. Depending on the shape and size of your head, some helmets will just feel better than others. The helmet should fit flat on the head about 1/2 inch above the eyebrows without tilting forward or back. Make sure the helmet does not shift around on your head. HECC certification date and CSA approved helmets must have all straps fastened (i.e. 1 for helmet under chin and 2 for face mask left and right side at all times). Failure to do this will result in a minor penalty. Mouth Guards are highly recommended for all players, but not mandatory within Red Circle. BNQ approved neck protectors must be worn. Goalie neck protectors will also include a 'bib' in the front. Shoulder pads are designed to protect the upper body including the upper arm, shoulder, collarbone, back, chest and ribs. You should choose a shoulder pad that offers the most padding in the chest area without inhibiting movement. To determine the size of shoulder pad to purchase, you will need to measure the circumference of the chest by placing a tape measure around the chest just under the armpits. This will give you a measurement that will help to determine the proper shoulder pad size. Your elbow pads protect your arm from the bicep extension of your shoulder pads to the cuff of your gloves leaving no part of your arm exposed. Your elbow should fit comfortably into the elbow pad cup and the elbow pad should fit securely without twisting or sliding on your arm. Your elbow pads and gloves should provide continuous protection from above the elbow to the tips of your fingers. The cuff of the glove should extend to the bottom of your elbow pads leaving no part of your lower arm exposed. To protect your fingertips, your fingers should not go all the way to the end of the glove. Put on your elbow pads. Hold your arm and hand outstretched. Measure the distance between the tips of your fingers and the bottom of your elbow pad. If you prefer a shorter cuff, you may consider wearing protective wrist guards in the uncovered area. Check out Step 2 for more equipment recommendations.